What do you usually do when you need to look inside a resident table somewhere in the middle of loading script? I guess you store it as QVD, then load this QVD in a separate temporary QlikView application, then create table box or something else to browse the table. 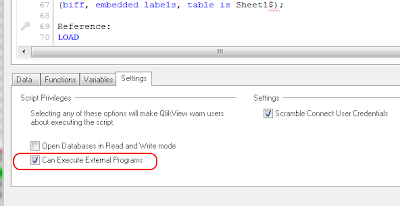 When execution of the loading script will come to this line it will open QViewer showing the table. Script will continue running as soon as you close QViewer. This is convenient technique that allows inspecting resident tables after every transformation like joins, concatenate loads, etc. You can have as many inspection points as you need during a single run. 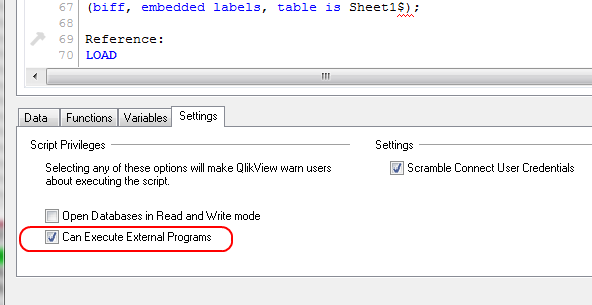 You may receive Security Alert from QlikView because of EXECUTE statement as depicted below. Just press Override Security button. Or you can change security settings in the bottom of the Script Editor window. You can put this snipped into some file (e.g. debug.qvs) and then include this file when you need to do debugging of some application. Also you might want to save inspected tables under their own names in some temporary folder -- just modify the snippet accordingly or add a new similar function, e.g. InspectSave. +Matthew Fryer proposes one more variant of the Inspect sub in his blog QlikView Addict. You can use EasyMorph for exactly the same purpose -- inspecting resident tables. 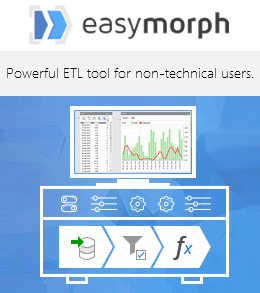 Pros: with EasyMorph you can do more than just viewing a QVD -- you can filter, aggregate, calculate new columns, join other tables, etc. Also the free EasyMorph doesn't have the limit of 100K rows as the free QViewer does. Cons: EasyMorph opens QVD slower than QViewer as it needs to convert them to its internal format. Also it's less memory efficient when it comes to large QVDs.